Simplified Registration Process The app now utilizes an SMS verification code rather than a security question and URL verification to enable faster, secure registration and password recovery. Request Access Feature We’ve added a new option where users can enter a unique Location ID to request access. The Building Manager will automatically be notified, the user will be added to the account, and the administrator can grant access. The Location ID can be found in the account area for partners, or in the administration area above the What’s New text area for customers. Mulit-Language Support The app now includes language support for English, Spanish, Portuguese and Indonesian. 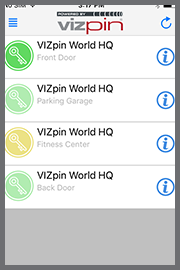 Check out our quick video on how VIZpin SMART works!